This is the first of a three-part book excerpt from The Playmaker’s Advantage, available wherever books are sold. By Daniel Peterson and Leonard Zaichkowsky, Ph.D.
How hard could it be? I was an adult, a dad no less, with a reasonable understanding of the game despite never having played soccer. They were a pack of nine-year-olds, veterans of at least two to three seasons of battle on fields with reduced dimensions and shrunken goals. Besides the color of their jerseys and shoes, they were open to nearly any of my suggestions as to our strategy, tactics, drills, and motivations to get the Saturday morning win and the red Gatorade that would follow. 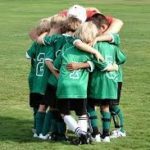 As a rookie volunteer coach, I researched and debated the best formation, attacking style, and starting lineups. Just feed my plans and knowledge into their curious heads, and we would surely hoist seven-inch-tall plastic trophies at the end of the season. Armed with a clipboard detailing each drill with its allotted time, I blew the whistle to start my first team practice. An hour and a half later I realized that young brains vary from adult brains on many levels. So many concepts, so many skills, and so many rules were like foreign language lessons to my future superstars. Explaining to one of them that “you were in an offside position when the ball was kicked” only resulted in a blank stare. My coaching advice to another that “we should not all chase the ball” was similar to saying, “Don’t chase the man handing out free ice cream.” Putting down my clipboard, I knew the practice had to be redesigned on the fly. I was trying to teach them calculus before they had mastered addition and subtraction. Despite the seemingly logical explanations and directions from me, they kept making the same mistakes. The mental workload was evident in real time on their faces as they struggled to transition from instructions while standing still to decision-making in motion. Yet, when I rolled out the ball and just let them play, out came flashes of athletic genius. What seemed to be innate skills of anticipation, elusiveness, creativity, and goal scoring suddenly appeared in a few players, but not all. This talent continuum looked much like a bell curve: some kids clearly got it and some didn’t, with the rest somewhere in the middle. For those who played effortlessly, the game flowed through them. They were at ease on the ball, almost toying with those trying to stop them. Movements were smooth, passes were crisp, decisions were advanced for their age. Athletes like these are the playmakers, the ones that teams are built around. Coaches search for them like lost lottery tickets. Parents dream that their offspring have this sixth sense. For me, it triggered a lot of questions. What is going on in the brain of each young athlete—especially in the playmakers? How do they learn the thinking, movements, and emotional skills required to succeed in and enjoy their sports at such an early age? How does that body of knowledge grow over time? Why do most kids stay at an average performance level while a few excel to the highest levels of a sport? Over the last decade, several theories have emerged to explain the elite-versus- novice difference; genetics, 10,000 hours of practice, unequal access to opportunities, and the sheer “luck” of getting an outstanding coach at the right time—these are just a few. While these variables may combine to contribute to an athlete’s growth, more detail is needed to understand why they work. Inherited abilities can provide the gifts of speed, power, and size but do they also offer learning efficiency, better working memory, and perceptual-cognitive maturity? Years of brute-force drills will improve skills, yet there are exceptions on both sides of the equation. Environmental advantages set the table for a rapid rise, but not all privileged kids excel. As you might have guessed, I believe it all starts with the brain, as does my coauthor, Dr. Leonard (Len) Zaichkowsky. As a professor, researcher, and consultant for almost four decades at Boston University, Len pioneered performance psychology as an interdisciplinary science, integrating the study of the brain with observed behavior. While my curiosity originated as a parent and coach interested in the workings of my players’ growing minds, Len has been asking similar but more rigorous and researched questions across three hundred published academic papers and speeches. Together, we wanted to create a resource, founded in science, that was accessible to millions of athletes, parents, and coaches. We partnered up as a writer and a professor to search, read, and summarize dozens of research studies, interview the scientists who wrote those papers, then validate those findings with today’s best coaches to be sure theory can survive at practice. In short, we were on a quest to find The Playmaker’s Advantage.